FrSky DHT Trace cut or No Trace Cut ? Ok I have everything wired and almost ready to test but I'm confused on one thing. 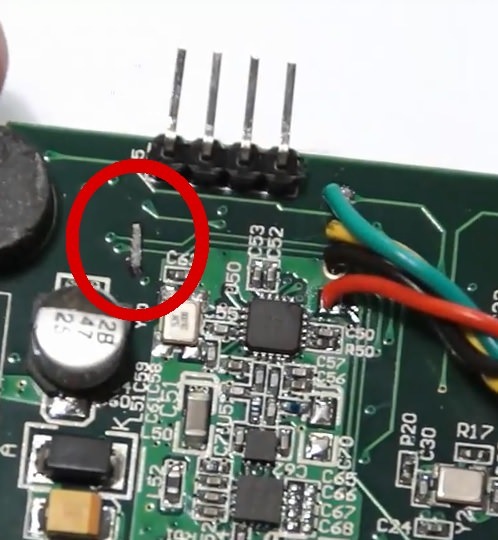 There are a few videos out there on how to get Telemetry to the TH9X or 9X from a DHT module but I came across one that the person says you need to cut 2 traces on the DHT board. Does this need to be done? I hate to burn something up in a puff of smoke. I have attached a photo I took from his YouTubevideo. I think this was back from 2012 or so. Re: FrSky DHT Trace cut or No Trace Cut ? I would not recommend that mod. You can use a level converter and not cut any traces. Let me get to a computer in a while and I will try to dig some info for you..
thank you, I saw that earlier jhsa. I hope I can find some of them close to me! Oh one thing since its a DHT I guess I don't have to worry about the 5Volts and Ground on the other 2 pins? I just have to connect the TX & RX to the DHT? Ok, my Level Converters are ordered. There are several mod versions each with theair advantages and disadvantages. The "inverterless" mod was designed precisely to avoid having to buy extra parts and wait for them. It works perfectly fine too. Yes it means cutting traces, so your choice to make whether you're comfortable with it or not and prefer waiting for parts instead. Adding the level converters does make the 9X more compatible with the module, and would also allow the use of a XJT in the future. See http://openrcforums.com/forum/viewtopic ... jt+#p57047, for my suggested mod for the DHT/DJT to make it useable in a FrSky Tx. Please connect the the level converter as shown on the link I posted. Including the 5V and GND. The pictures show it really well.. I always recommend the mod with the level converter for a couple reasons. I have seen, and helped to repair a few mess ups from people that damaged their modules. I don't think it is good practice messing up with the internals of an RF module or receiver, unless you have the knowledge to do it safely. Also on a DJT that plugs to the module bay, I recommend the mod with level converter for the above reason, and also because it can also be used on other radios with other boards, like the 9XR-PRO, 9xtreme, ar9x, etc. Not the Taranis though unless you add a diode (please follow Mike's link above). I was confused by the VCC & Ground going into the line converter but not coming out to feed the DHT. Ok I know what needs to be wired and where to get all the connections now. Those you are pointing are not VCC and GND.. "NC" means "Not Connected"
ok so connect everything on the Line Converter but the one marked "NC"
NO, connect exactly as the link I posted above..
My Mini RS232 to TTL converters came in. I'm not sure if it matters where pin 1 on the chip faces? Does it matter which way the converter gets wired? Oh, and all the photos I can find are pretty blurred and hard to make out. In one photo it looks like pin 1 point away from the DHT module. Look at the markings, you want RS232 on module side. I went back and looked at the how to post and like you said the module talks RS232 and the Atmega talks TTL. OK I finally wired everything up and I have no Telemetry. Also the Throttle Switch indicates on along with the Aileron Switch. I must have something wired wrong. You do not have the right firmware or setting. Need to know what you have on now. What firmware do you have installed on your radio? Er9x or openTX? Also what processor is in the radio? m64 or m128? I have triple checked that the RS232 side of the converter is pointed to my DHT module and TTL is pointed to my main board. I have a 470 Ohm resistor going to Mosi. One other thing I noticed when turning on the transmitter is it sometimes is blank. Turning it off and back on once or a few times will get ER9X to come up?? Have you set the "FrSky Mod Done" setting in the Hardware menu? Enable the Hardware menu by powering on with the left horizontal trim held to the left. I think I looked for that in the past but couldn't figure it out. Need to know what version of er9x. Could be old enough for the option not to be there yet, before that you had to use a different firmware file altogether. I was going to post it last night but wasn't sure if I needed it. I looked all over for the instructions on how to set the FrSky MOD done but haven't found it anywhere by the way. Holding the left horizontal trim to the left and powering on does nothing. I'm guessing I have the wrong version? Please go to www.er9x.com and download the version "er9x for Mega128 processor". Then install it..
That version is, in fact, r821, I slipped up with the SVN number on the build. Holding the left trim to the left should give a message "Hardware Menu Enabled" at power up, then you should find the Hardware menu is accessible from the Radio Setup Menu. That's funny Mike because I just installed the ER9x Mega128 file as jhsa noted and it is the same thing lol. I did finally find the hardware enabled menu and enabled the FRSKY MOD - Thank you ! I had to move around some TX & RX wires on my RS232 converter and I finally have something. I thought you were able to see voltage somehow but I don't see anything. A "D" receiver (e.g. D8R) will send A1 and A2 voltages, but you need to set the scaling in the telemetry menu to get the correct value displayed, see the manual referred to 5 posts back for how to do this. I saw that and was playing with voltages but I wasn't sure if that was coming over from receiver. I just want to thank everyone again for all your help.